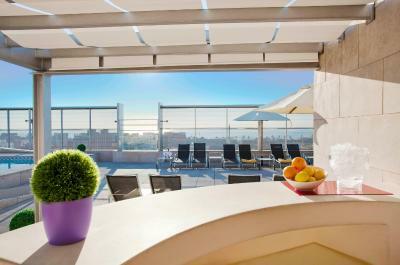 Lock in a great price for Ilunion Barcelona – rated 8.2 by recent guests! Staff very friendly from Jose in the front desk to Eric from the hotel restaurant. 10/10!!! The staff is very nice and helpful. They got us a car hire that both delivered and picked up the vehicle from the hotel. The beds are comfy and location is good because there’s not too much noise in the mornings and the bus stop is a 2 min walk. The hotel was in a good location, with walkable distance to the beach. We had a Junior Suite which by the way was the largest hotel room we have ever stayed in. They provided complimentary soft drinks as well as coffee and tea. Did I mention that our room had a balcony with views of the beach and Mount Tibidabo?! Overall a very nice hotel, there was a rooftop pool and a small gym. During our visit, there was construction/renovations being made so it was a bit dusty and noisy. However, the upgrades looked amazing from what we could see. One thing I would like to add that I learned during our stay which really touched our hearts is the fact that they employ about 40% of individuals with disabilities. I think that is a great reflection on the values of the company. We will return. We loved our stay here! Our room was large and comfortable with s view of the ocean. The bed was comfortable and the room services was reasonable. They even had a nice crib for daughter. We can’t wait to go back. Rooms were very comfortable, including bed and pillows. The breakfast was good and the staff at restaurant we’re accommodating. The location is very good-near the beach and in a very nice neighborhood. Metro was a short walk also. The location is great with lots of options for good food, is close to the metro station and the beach. Very good breakfast, multiple possibilities, from fruits, deserts drinks and others. Located nearby the sea, in a quite place with multiple possibilities to have dinner nearby. great view and nice location. Room was very comfotable. Free water in the fridge and tea/coffee replaced on every cleanup. Cattle was included. Beds were nicely put. Pool is available for everyone on floor 8. Good breakfast, helpful receptionists, spacious rooms. 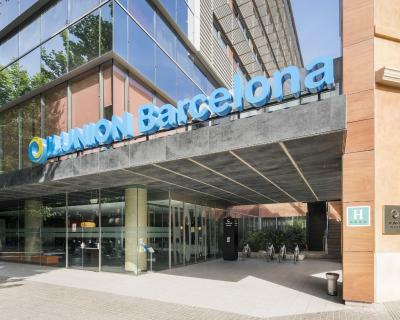 Ilunion Barcelona This rating is a reflection of how the property compares to the industry standard when it comes to price, facilities and services available. It's based on a self-evaluation by the property. Use this rating to help choose your stay! 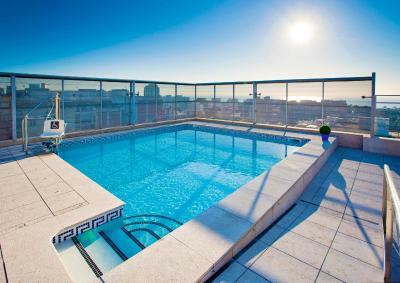 Located 10 minutes’ walk from Bogatell Beach in the 22@ district, the modern Ilunion Barcelona features a rooftop swimming pool, sun terrace, and a gym with stunning views of the city and the sea. The CCIB Conference Center is 1.2 mi away. Free WiFi is available. 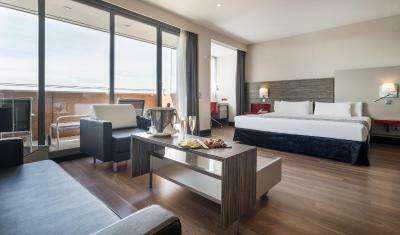 All stylish rooms at Ilunion Barcelona feature modern décor and wooden floors. They include air conditioning, a work desk, flat-screen TV, and a large private bathroom with a hairdryer and free toiletries. A safe and a mini-bar are also available. 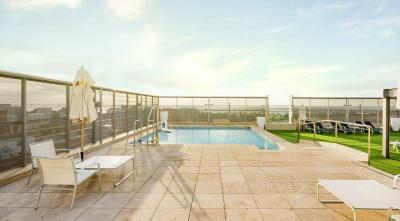 All superior rooms feature a furnished terrace with views of the city or the sea. Ilunion Barcelona's restaurant offers a buffet breakfast, as well as an a-la-carté or set menu. There is also a snack bar, and room service is available. An additional menu is available for guests with special dietary needs. 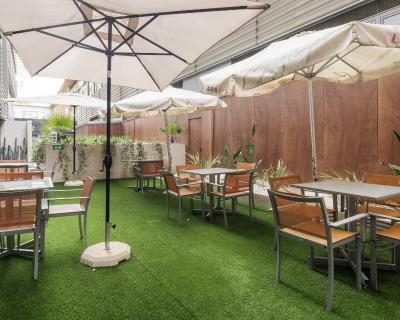 There is a wide range of shops, restaurants and bars in the Poblenou and Bogatell Beach areas, just a few feet from the hotel. Diagonal Mar Shopping Center is 8 minutes' drive away. Other facilities at Ilunion Barcelona include a free internet corner equipped with computers to stay connected during your stay. Private underground parking is available for an extra cost. 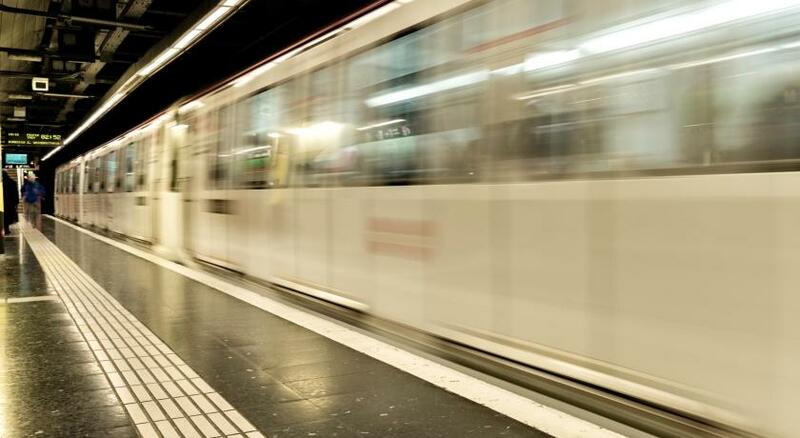 Llacuna and Poble Nou Metro Stations are within 1,000 feet of the hotel, connecting with the city center in just 10 minutes. 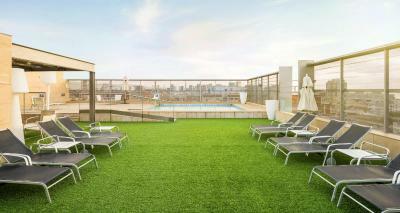 Gran Vía is a 15-minutes ride away by bus, and tourist busses stop within walking distance of the property. Barcelona-El Prat Airport is 12 mi from Illunion Barcelona. 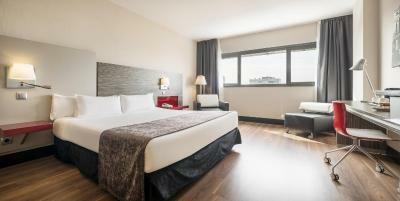 When would you like to stay at Ilunion Barcelona? This modern room features a large double bed or 2 singles, as well as a flat-screen TV and a work desk. Free Wi-Fi, some bottled water and pillow menu are also available. Private parking is available on site (reservation is not possible) and costs EUR 17.50 per day. This modern room features a large double bed with 1 single, or 3 single beds. There is a flat-screen TV and a work desk. Free Wi-Fi, some bottled water and pillow menu are also available. This room features a large double bed and a living room with a 43" flat-screen TV. There is a private terrace, offering sea or city views. The bathroom has a hydromassage bath. Free high-speed WiFi and and an electric kettle with assorted teas and instant coffee are included, as well as a complimentary mini-bar with soft drinks and water. This modern room features a large double bed with a folding bed, or twin beds plus a folding bed. There is a flat-screen TV and a work desk. Free WiFi, some bottled water and pillow menu are also offered. Ilunion Barcelona is located just 600 metres from Bogatell beach, 2 Km from the CCIB Conference Centre and within the new technological district @22, the most innovative area in Barcelona were tech companies coexist with universities, research centres, residential areas, green areas and the beach. Hotel provides free Wi-Fi throughout and stunning views over the beach and the city from the upper floors, the rooftop pool and the gym. 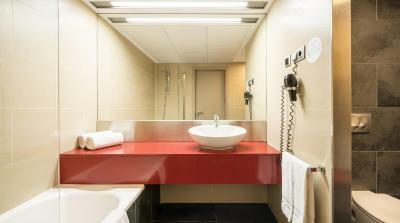 The 224 rooms are bright and feature modern décor, satellite TV, air-conditioning and a large private bathroom with hairdryer and complimentary toiletries. They also come with a large 43 inches flat-screen TV, free safe and a minibar with free bottles of mineral water. 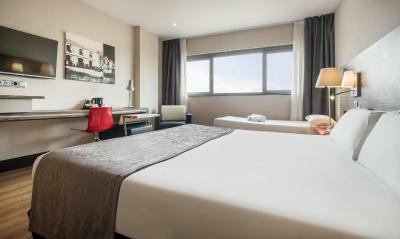 All superior rooms feature a cozy and furnished terrace, with views over the city and or the beach. ILUNION is the hotel chain of the ONCE Business Corporation, with more than 25 years in the tourism industry. We focus on the real wellbeing of our customers, but what makes us a unique chain, is our commitment to social wellbeing. House Rules Ilunion Barcelona takes special requests – add in the next step! Ilunion Barcelona accepts these cards and reserves the right to temporarily hold an amount prior to arrival. 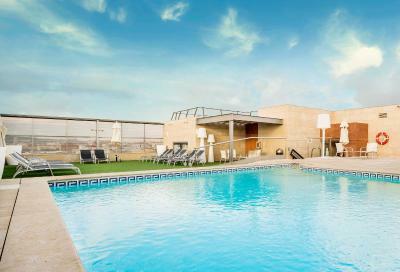 Please note that the outdoor swimming pool is open from mid March until October 30th, subject to weather conditions. Not ready at checkout, no real room instructions like you need the keycard to turn the lights on. Refrigerator wasn't cold. Locations was terrible for sightseeing the most important tourist attractions. Loud construction right out our window. Front desk 24 h. Although they were not the most polite and did not put in a lot of effort to help solve some problems. But at least the reception was available 24/7. The shower floods the entire bathroom easily. 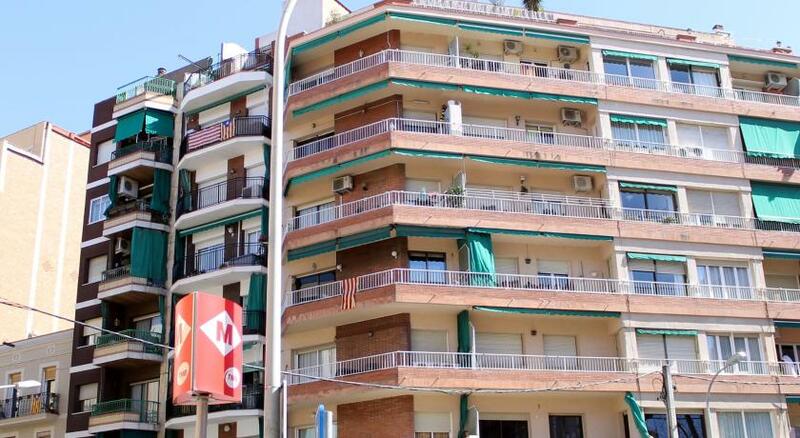 The location was good having been to Barcelona many times and allowed to see the Poblenou neighborhood but is not centrally located for a first time visitor. You won’t find much nightlife or restaurants compared to what other parts of the city have to offer. Breakfast is over priced if not included with your room. The lobby was also undergoing significant construction work. Pictures of the rooftop are misleading, the deck is small with an unheated pool and has large walls that prevent seeing what would be amazing views. 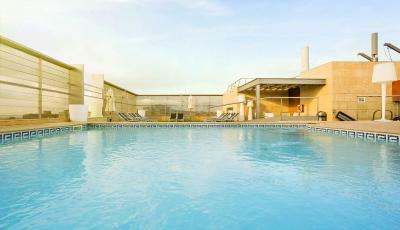 Large rooms and good views of the city from higher floors and gym area. Very short walk to some of the best beach areas. The bathroom was huge and offered great privacy, but if there was one thing I could say, it would be that they could have cleaned the tub and shower stall a bit more. The room was not ready by checkin-in time and had to wait almost 2 hours to get a room. They said it was due to maintenance but still after an 8 hour flight it was inconvenient. Also, the hotel was aware of people lurking around the hotel to steal but yet no security was present (only at night). Our friends’ bags were stolen from the restaurant at 7am! That was our only bad experience. A fantastic 6 days spent at the Ilunion. We received a complementary room upgrade which was kitted out with a balcony with a sea view, along with a large comfy bed and a powerful shower. For the price, Ilunion exceeded our expectations and would stay again in a heart beat. The hotel were refurbishing the lobby and common areas so a little bit of disruption. However it looks to be a lovely refit so will be worthwhile. The location was amazing.. Fast check in and out..